Why shrinking priors shrink ? where only a small number of are non zero. All these results are super nice, but still we want to know why do some shinking priors shrink so well and others do not?! 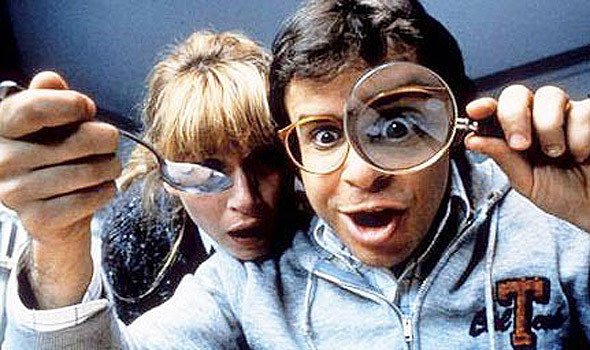 As we are all mathematicians here, I will reformulate this last question: What would be the conditions on the prior under which the posterior contracts at the minimax rate1 ? since this family of priors encomparse all the ones studied in the papers mentioned above (and more), so it seemed to be general enough. Our main contribution is to give conditions on such that the posterior converge at the good rate. We showed that in order to recover the parameter that are non-zeros, the prior should have tails that decays at most exponentially fast, which is similar to the condition impose for the Spike and Slab prior. Another expected condition is that the prior should put enough mass around 0, since our assumption is that the vector of parameter is nearly black i.e. most of its components are 0. More surprisingly, in order to recover 0 parameters correctly, one also need some conditions on the tail of the prior. More specifically, the prior’s tails cannot be too big, and if they are, we can then construct a prior that puts enough mass near 0 but which does not concentrate at the minimax rate. We showed that these conditions are satisfied for many priors including the Horseshoe, the Horseshoe+, the Normal-Gamma and the Spike and Slab Lasso. The Gaussian scale mixture are also quite simple to use in practice. As explained in Caron and Doucet (2008) a simple Gibbs sampler can be implemented to sample from the posterior. We conducted simulation study to evaluate the sharpness of our conditions. 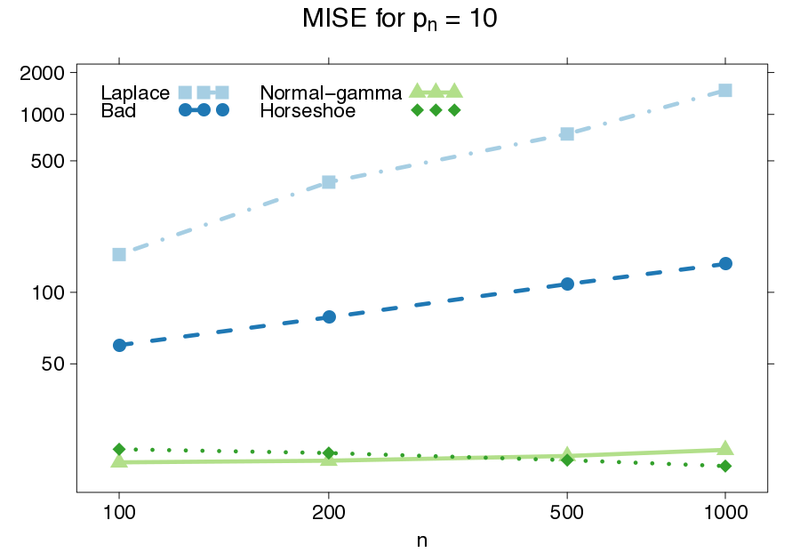 We computed the loss for the Laplace prior, the global-local scale mixture of gaussian (called hereafter bad prior for simplicity), the Horseshoe and the Normal-Gamma prior. The first two do not satisfy our condition, and the last two do. The results are reported in the following picture. As we can see, priors that do and do not satisfy our condition show different behaviour (it seems that the priors that do not fit our conditions have a risk larger than the minimax rate of a factor of ). This seems to indicate that our conditions are sharp. At the end of the day, our results expands the class of shrinkage priors with theoretical guarantees for the posterior contraction rate. Not only can it be used to obtain the optimal posterior contraction rate for the horseshoe+, the inverse-Gaussian and normal-gamma priors, but the conditions provide some characterization of properties of sparsity priors that lead to desirable behaviour. Essentially, the tails of the prior on the local variance should be at least as heavy as Laplace, but not too heavy, and there needs to be a sizable amount of mass around zero compared to the amount of mass in the tails, in particular when the underlying mean vector grows to be more sparse. Caron, François, and Arnaud Doucet. 2008. “Sparse Bayesian Nonparametric Regression.” In Proceedings of the 25th International Conference on Machine Learning, 88–95. ICML ’08. New York, NY, USA: ACM. Carvalho, Carlos M., Nicholas G. Polson, and James G. Scott. 2010. “The Horseshoe Estimator for Sparse Signals.” Biometrika 97 (2): 465–80. Pas, S.L. van der, B.J.K. Kleijn, and A.W. van der Vaart. 2014. “The Horseshoe Estimator: Posterior Concentration Around Nearly Black Vectors.” Electron. J. Stat. 8: 2585–2618. Polson, Nicholas G., and James G. Scott. 2012. “Good, Great or Lucky? Screening for Firms with Sustained Superior Performance Using Heavy-Tailed Priors.” Ann. Appl. Stat. 6 (1): 161–85.